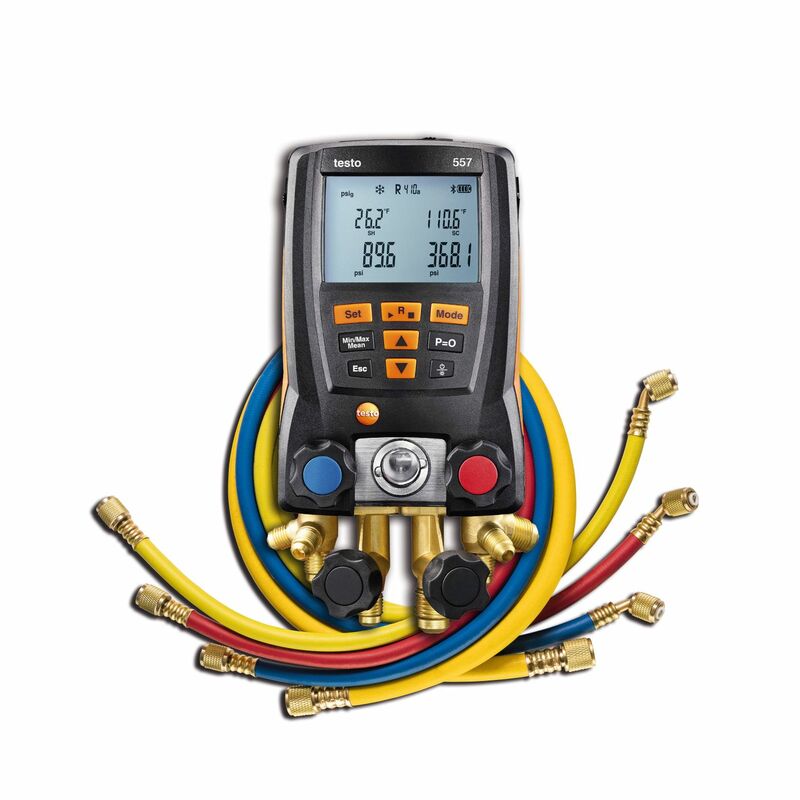 The complete kit for work on air conditioning and refrigeration systems, as well as on heat pumps: the testo 550 digital manifold, including a set of 3 hoses. This kit enables you to get down to work right away! 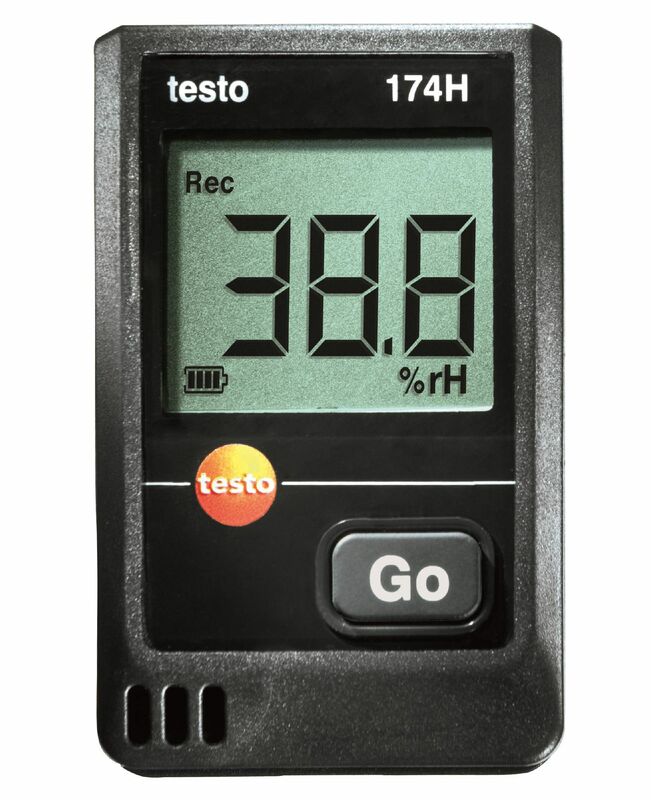 The instrument can be used for 60 refrigerants, automatically calculating superheating/subcooling and can be connected to your smartphone/tablet via the testo refrigeration App. You can also use the powerful testo Refrigeration App to monitor the manifold via your smartphone/tablet and to store the measurement results or send them by e-mail as a complete report. 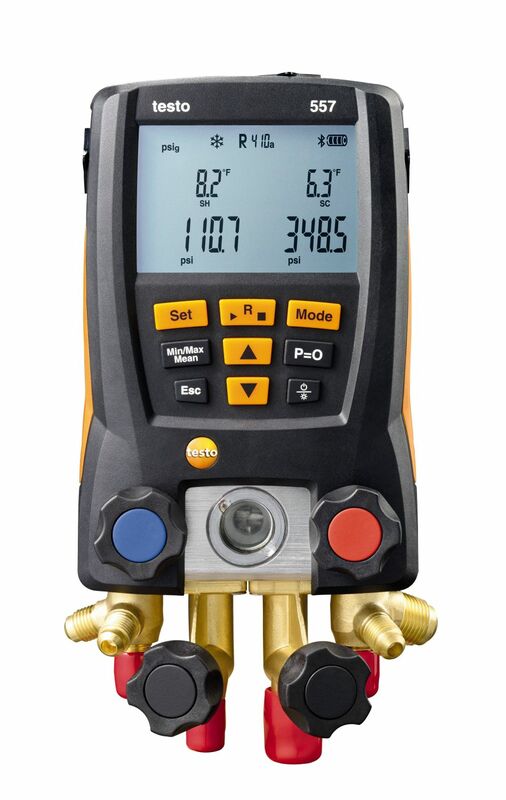 The testo 550 instantly displays superheat and subcooling for up to 60 refrigerants. It also measures high / low side pressures and temperatures. 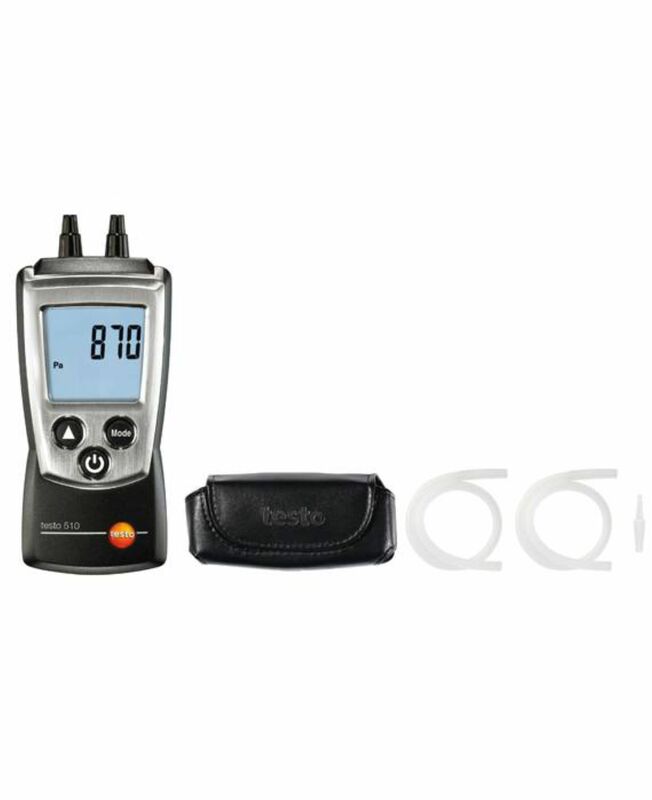 With its free Bluetooth linked app, the testo 550 opens up new possibilities for efficient analysis and documentation. 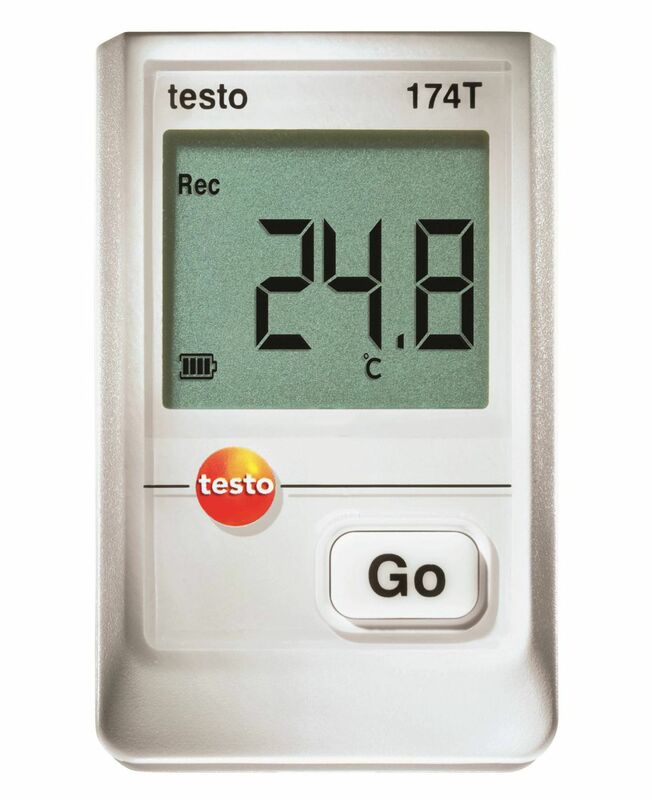 The testo 174H mini temperature and humidity data logger features a large display and alarm indication that makes it capable of monitoring air temperature and relative humidity levels at all times. This temperature and RH measurement logger is long lasting for continuous use and is highly accurate. The 174H temperature and humidity data logger has free software available as a download for easy analysis. 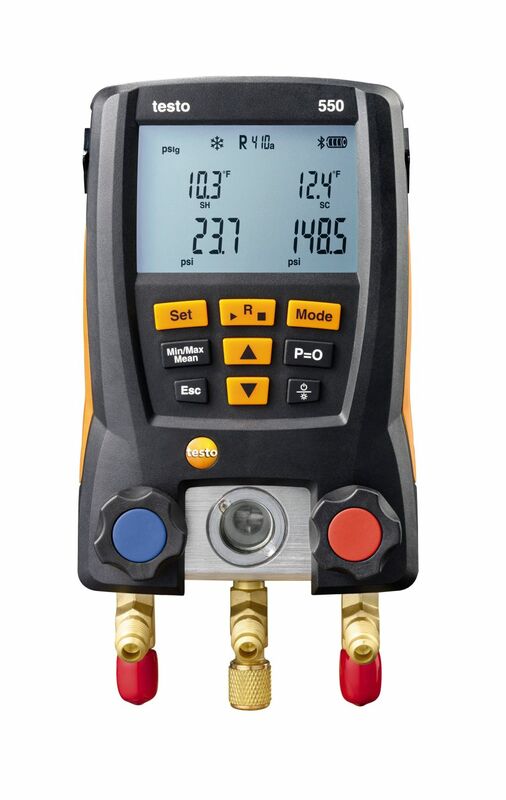 With the testo 510, performing system tests has never been easier using our single, easy to use, rugged, compact digital manometer. Its small form factor, bright backlit display, and magnetic backing will enable the 510 to be used in a wide variety of applications. 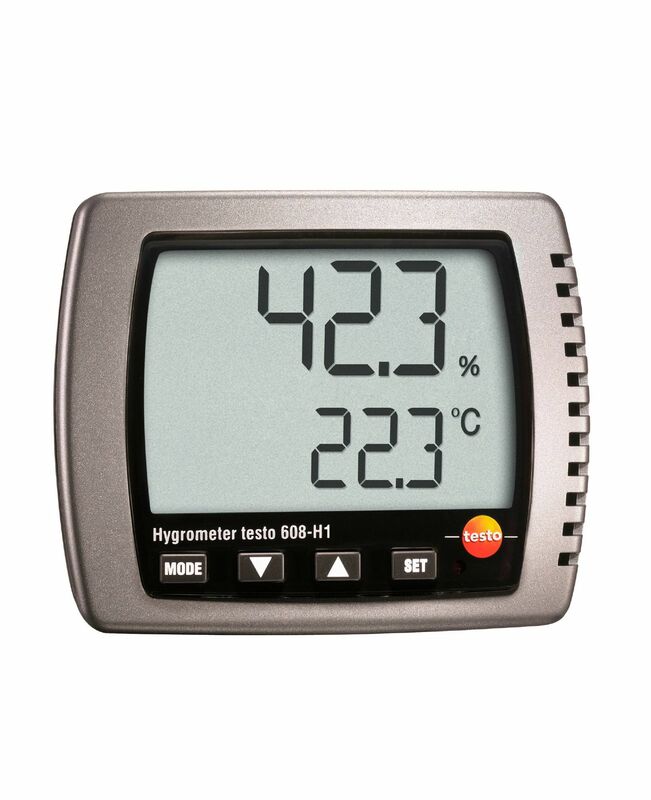 The testo 608-H1 thermal hygrometer enables you to have a continuous display of the current temperature and humidity values. This means you can always keep an eye on the indoor climate. 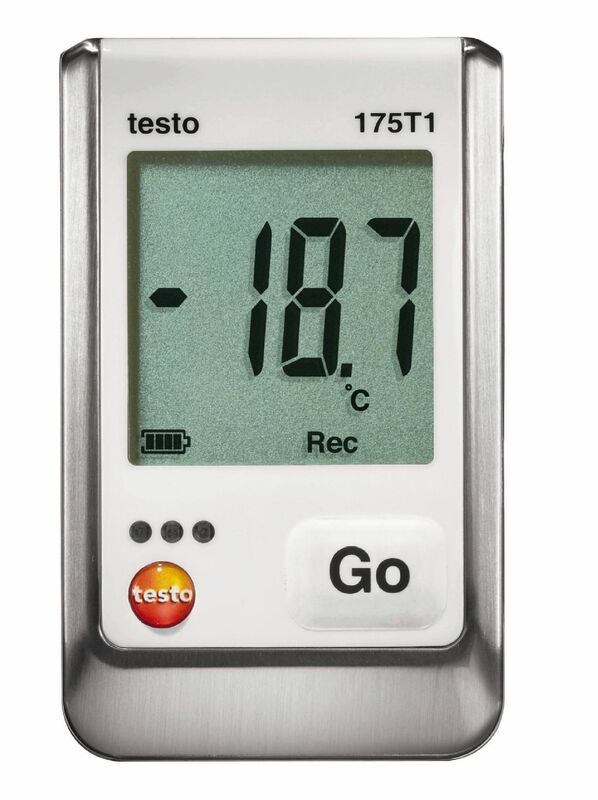 The testo 175H1 temperature and humidity data logger features a large display and alarm indication that makes it ideal for continuous monitoring of ambient temperature and humidty. The 175H1 has an external, stub type humidity sensor, making it best-suited for use in high humidity areas. Creation of Excel Spreadsheets, PDFs, and data analysis are all easily achieved with the free, downloadable ComSoft software. The testo 174T mini temperature data logger features a large display and alarm indication that makes it ideal for continuous monitoring of storage temperature. This temperature measurement logger is long lasting for continuous use and is highly accurate. The temperature measurement logger includes free software available as a download for easy data analysis. Reliably optimize the use of cooking oil to save costs and ensure brand protection. 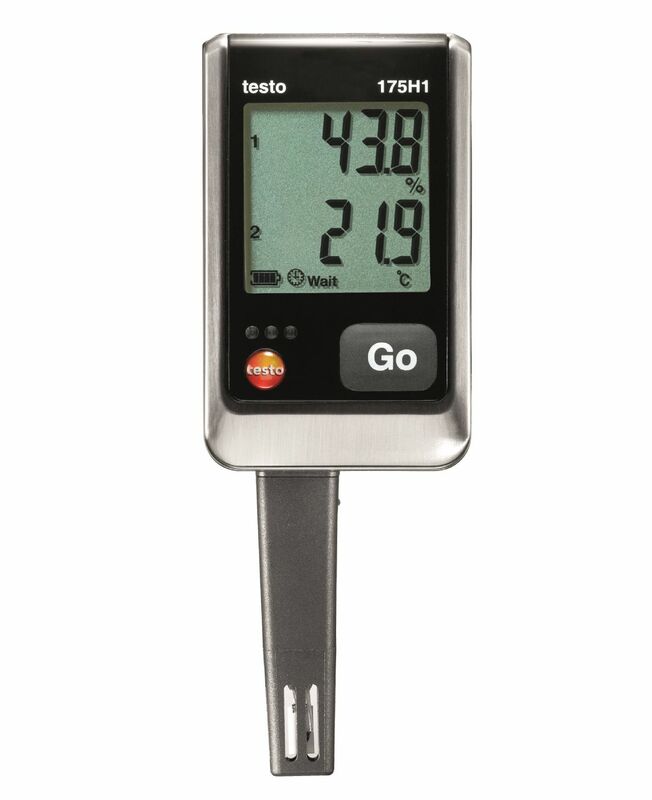 The testo 270 cooking oil tester quickly, easily, and reliably determines cooking oil quality. The new testo 270 cooking oil tester stands out thanks to its ergonomic design, which protects the hand from direct exposure to hot oil. The clear alarm via the colored backlit display makes it even easier to evaluate the cooking oil quality: Green means the TPM content is OK. Orange: TPM value is borderline. Red: Your TPM limit has been exceeded. 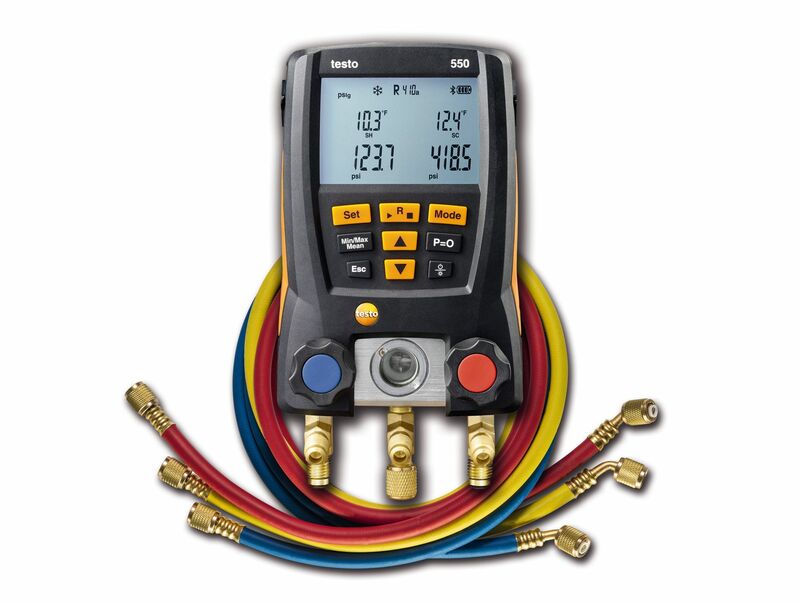 The testo Smart Probes AC / Refrigeration test kit is ideally suited for testing air conditioning and refrigeration systems and installing them. The large testo HVAC softcase enables the measuring instruments to be conveniently transported and ensures that they are always to hand when they are needed. 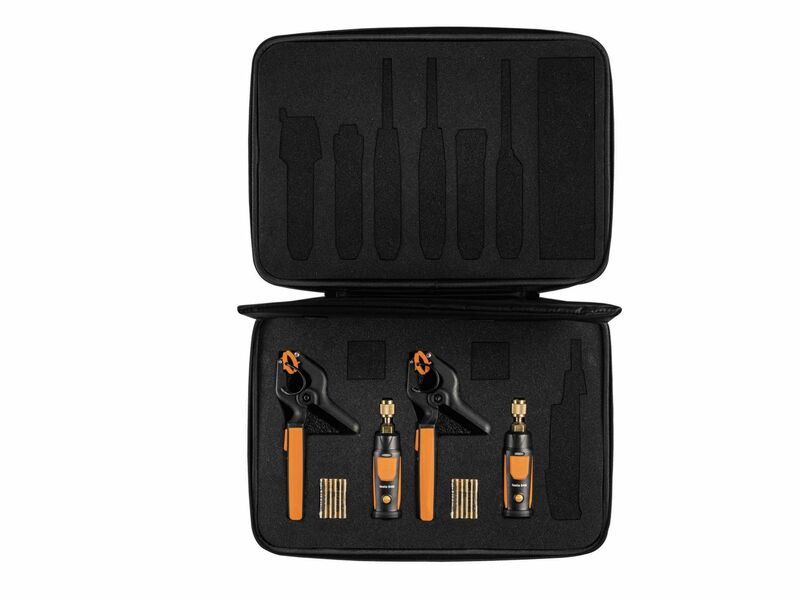 The testo AC/R Smart Probe Set is a combination of four instruments that measure high-side and low-side pressures and temperatures of A/C and refrigeration systems. Configured to be used during the commissioning, servicing, PM, and troubleshooting of A/C and refrigeration systems. This kit can be operated without the need for any other tools, besides your smartphone to communicate with the instruments. Low-loss AC/R system checks, with no hoses required! 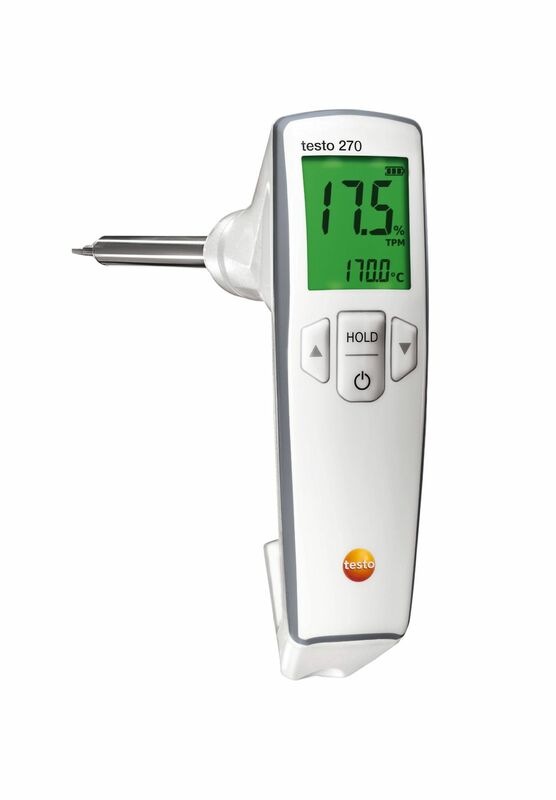 The testo 104 dual purpose IR and penetration thermometer is ideal for both food inspectors as well as receiving departments. 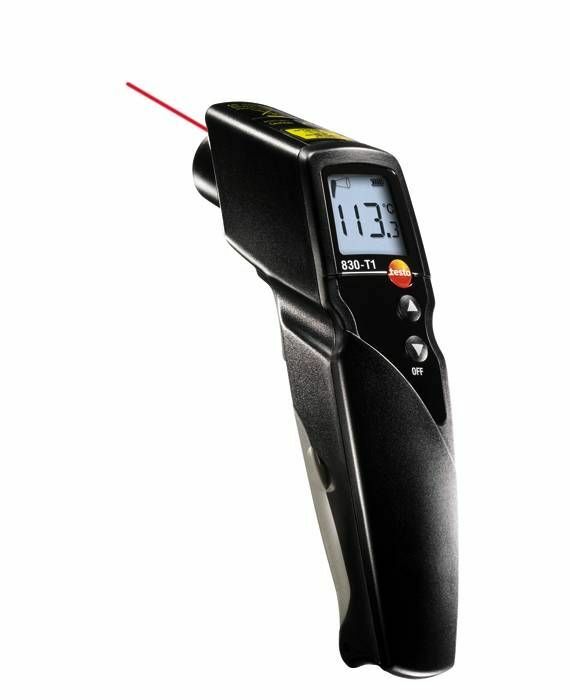 With the ability to scan surface temperatures from a distance using the IR sensor, and a fast response folding NTC penetration probe for core temperature checks, the 104-IR is an ideal thermometer for all aspects of the food industry. 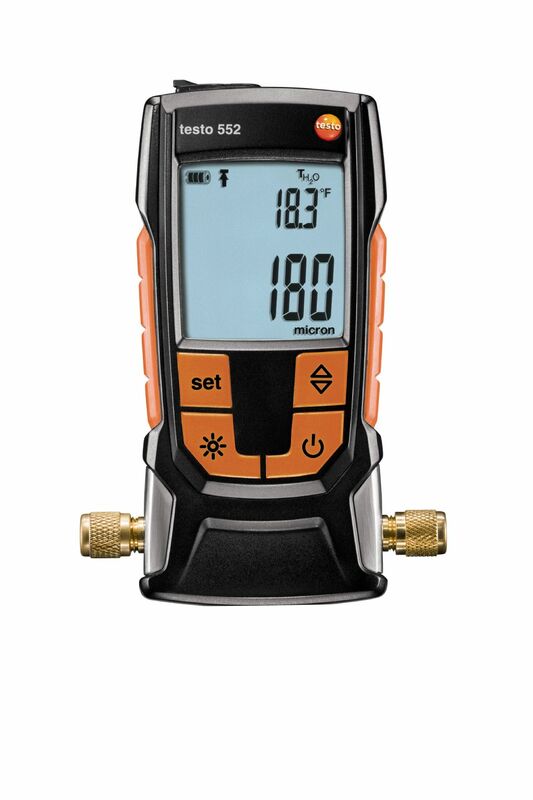 The testo 552 digital micron gauge is ideal for monitoring the evacuation of air conditioning, refrigeration, and heat pump systems. It is rich in features that make your work faster, easier, and more accurate. 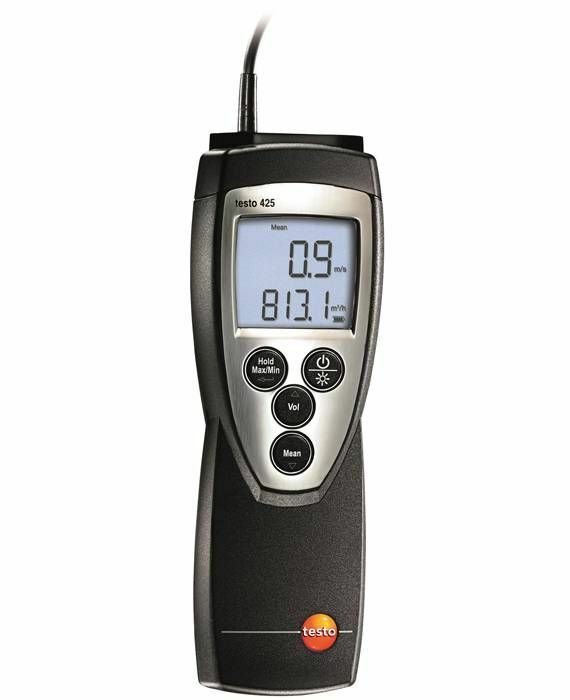 The testo 830-T1 infrared thermometer allows for efficient, non-contact surface temperature measurements to be carried out. 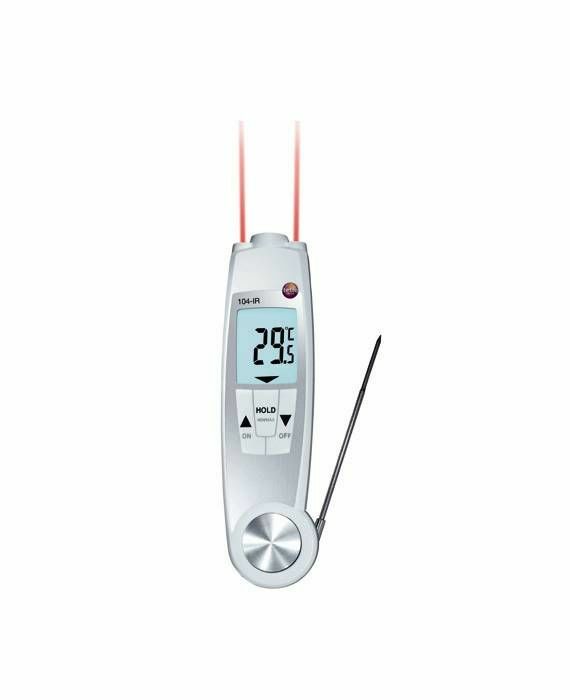 This IR thermometer will leave you well equipped, especially for control readings in trade and industry. The gun style design is easy to handle, and the integrated processor provides accurate measurement results. 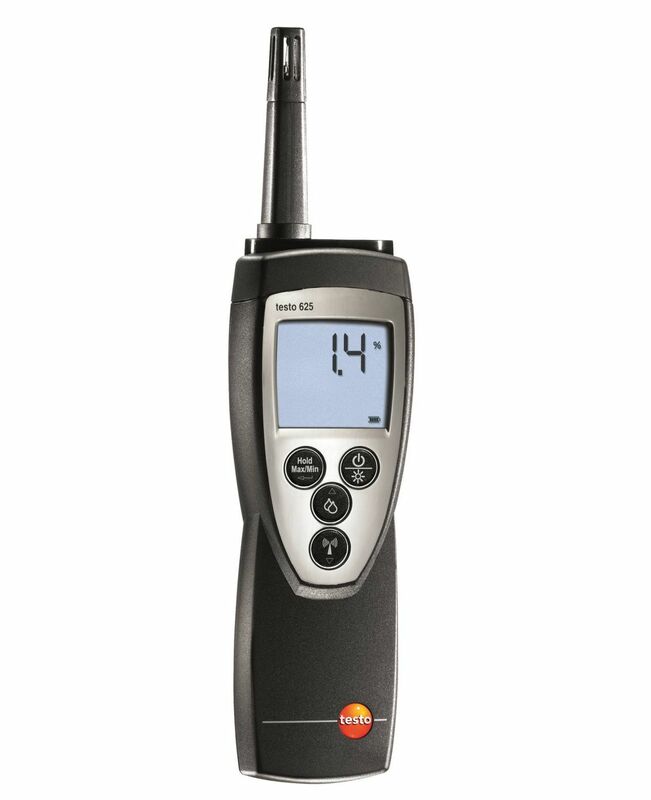 The testo 175T1 temperature data logger features a large display and alarm indication that makes it ideal for continuous monitoring of storage temperature. The temperature measurement logger is ideal for dependable temperature monitoring in refrigerated and deep freeze rooms for extended periods of time. Creation of Excel Spreadsheets, PDFs, and data analysis are all easily achieved with the free, downloadable ComSoft software.